I started this series of posts about my fashion design & sewing project by talking about the experience of conceptualizing the designs and finding the fabrics in New York’s Garment District. The next leg of the journey was all about figuring out how I was going make all these pieces a reality. I’d say this was the hardest part, but when I think about what it took to actually sew these outfits, I feel a mild PTSD reaction coming on. Nevertheless, the process of drafting the designs for concepts was a huge learning experience that was very time-consuming (and satisfying). I find commercially-made patterns to be overwhelming and confusing. I can never figure out how the pieces fit together or how to cut it so that it fits correctly. I should also mention that I’m absolutely awful at following written instructions. For as long as I can remember, it’s been a miracle if a ready-made piece – or something made based on an existing pattern – fit me well. I’m short and curvy and my hips are significantly wider than my upper body. For this reason, my mom made every single one of my special occasion dresses and a bunch of other things for me (in addition to altering countless pieces of clothing) when I was growing up. I’m very, very lucky that my mom not only had the patience and good will to make all this stuff for me, but also a stunning level of skill that I can only hope to one day emulate. She also has incredible taste in fabrics and knows how to work with just about any material you can throw at her. Unlike me, she is an expert at working with patterns. Despite her efforts to help me feel comfortable with them, I keep going back to either making pieces without them or creating the patterns myself. Working on these new pieces I made in 2018 was the first time I made patterns the “real” way–meaning that I went through the same process that fashion design students would undergo. Except my drafting table was the floor, the lighting was terrible and I had no one teaching me. All good! It made me even more resourceful than I already was. One handy reality is that I love geometry. A lot. So I wasn’t daunted in the least when I had to bust out my T-square and other related tools in order to draft my patterns. No…the hard part was understanding how I’m actually shaped, coming to terms with it, and adjusting the ideas I had to fit ME rather than the tall skinny models that are the only ones ever shown wearing the amazing things I want to wear. Also, the translation from 2D to 3D was pretty trying at times. It can be surprisingly difficult to figure out how to draw & cut pieces of fabric to that they come together to form a certain shape and take up 3D space in the way you envision it. This is where existing sewing patterns would come in handy, but alas I never seem to find one when I’m trying to make the structured, futuristic fashion I envision. I always end up modifying my tracings like I did for the CEO jacket. After seeing some throwback 80s style blazers with power shoulders, I started searching online for something similar, but more modern. I found photos of Rihanna wearing a Balmain Jacket with amazing high shoulders and I just thought it was so badass. I wanted one with different colors and even bigger shoulders, so I searched the Google (and Etsy, and eBay, and out of desperation aliexpress) yet again. To no avail (of course). I mean, my friends call me the Internet Super Sleuth and that name is well-earned. I can find anything – so if I couldn’t find what I was looking for, it doesn’t exist. At least not online. Being short on time and know-how, I scoured Etsy for craftspeople with some similar creations. I found one that had some impressive-looking pieces in his store. I ended up commissioning him to make the CEO Jacket. I was so excited that for once I wasn’t going to have to do everything on my own and waited excitedly for my new music-video-worthy blazer. Upon receiving said jacket, I was mortified that it looked nothing like the agreed-upon design or the links I’d sent him. It wasn’t even the right fabric. It looked like a cheap black modern-ish motorcycle jacket and had a zipper for crying out loud. Blazers don’t have zippers! Therefore, once again I had to take matters into my own hands and make the blazer myself. With only a few weeks left till the video shoot and no idea how I was going to pull that off, I was super lucky that it was Christmastime and my mom was visiting. She helped me make the pattern based on a cheap blazer I’d found on eBay. You’ll need lots of blue painter’s tape and rolls of tracing paper. Find a piece of clothing, in your closet or at a thrift store, that comes close to what you’d like to make, at least at a basic level. Notice the panels that make up the piece of clothing (e.g., for a blazer, you’ll commonly see a 2 panels sewn together to make one side of the front, 1 long piece that makes up the lapel on one side connecting to the collar piece in the neck area, and so on). Using small pieces of tape, fill in a panel, using the seams of that panel as your guide. Use long pieces as the foundation, and overlap as much as possible without wasting tape. This will make it easier to pull your “tracing” off in one piece. You’ll use smaller pieces of tape when going around curves or corners (you want these on top so they don’t come apart later). Have a large piece of tracing paper ready. 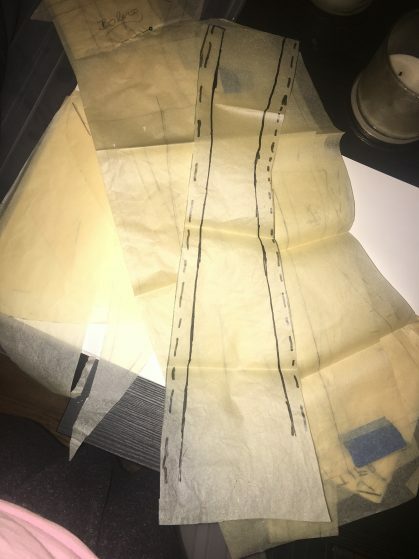 When the panel of clothing is completely filled in with the tape, gently pull the whole tape “tracing” off the fabric. Place one edge of the tape tracing on the tracing paper, taking care not to let the tape buckle or fold. “Roll” out the tape onto the tracing paper very slowly, making sure to keep it flat. (You can use a rolling pin if it makes sense, and/or use it after the tape is on the paper, if you have tiny imperfections to smooth out). Take another piece of tracing paper and place it over the shape you’ve made of tape. I recommend taping it down either on to your drafting surface or onto the first piece of tracing paper. Keeping it still is *very* important. Now, using a Sharpie (or pencil or whatever you’re comfortable with) and trace the Tape Shape. Using a ruler (not a floppy sewing tape measure), measure your seam allowance, starting from the line of your tracing. I use a 5/8″ seam allowance everywhere. It’s important to have a consistent seam allowance for ALL the pieces of each pattern, so you don’t screw up when sewing the actual pieces of fabric together later. Think about it: If one piece has a 5/8″ allowance and another 3/4″, the pieces won’t line up properly when sewn together and you’ll end up with a mess. Measuring out from your original trace line all along the way, make a series of dashes that follow the shape of your tracing. The result will be a repeat of your tracing, only 5/8″ wider/bigger all the way around. NOTE: If you need to modify the shape that results from your Tape Shape, you’ll need to do this before you trace it. And therein lies a challenge. I knew I’d have to modify this pattern significantly from the original blazer. I wanted the shoulders to win against Rihanna’s in a fight, and wanted a slightly wider lapel. This is where things can get complicated and drawing skills come in handy. But even if you’re not good at drawing, you can make it happen as long as you measure everything meticulously and use a rule to keep your lines straight when necessary. For this most recent sewing project, my designs were *much* more ambitious, and it was harder to find existing foundation pieces to base my patterns on. I only successfully used an existing article of clothing once this time round – and it was for the bolero jacket I made. That was by far the easiest piece, because I had a basic shrug to base it on. The bell sleeves were hard to figure out because I wanted them to be more circles than bells, but everything else about it was a cinch. I made the tape pattern as described above using my existing simple shrug and simply made the sleeves shorter to accommodate the bells I added. I didn’t cry while making this one! I contemplated throwing in the towel, however, when it came to making the bustier. Oh, the bustier. My determination and belief in myself was tested by the making of this thing, and I’m happy to say I came out of the battle smiling…but it almost won. All I had to go on was a photo I’d found online of an amazing outfit that summed up my love for beautiful fabrics, futuristic fashion, and the combination of strength and femininity that’s hard to find in street fashion. I’ll go into detail about making this pattern from scratch and how the bustier & accompanying outfit turned out in my next post. Thanks and stay tuned!